Time travel and alternate timelines have always been a subject of much complexity that’s not just limited to Dragon Ball, but several other stories like Flash, Back to the Future, Doctor Who, and Steins Gate. 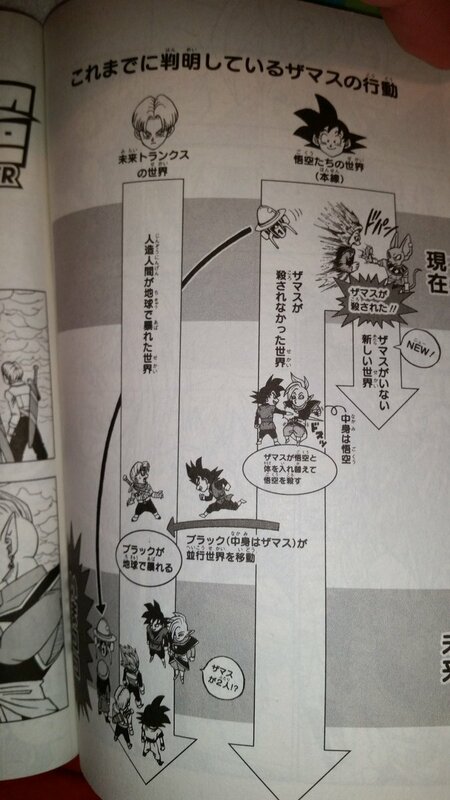 We were first given an official explanation in the Daizenshuu 7 showing 4 distinct timelines in Dragon Ball Z. The fourth timeline, called the “Unseen” timeline, has been heavily debated and did not make logical sense to many people. Hence, today I will explain how the fourth timeline, the Unseen Timeline, CAN indeed fit with logic and explain everything. I have gathered all the information from DBZ, DBS, Daizenshuu, and Chouzenshuu to explain all the different timelines, how they were created, when they were created, and the what if scenarios of the unknown timelines. This will explain timelines in Dragon Ball completely once and for all. It will be a three part series. The first part will discuss the original 4 timelines before Dragon Ball Super and the second part will discuss the new timelines that were added after Dragon Ball Super. The third part is the expanded DB universe (DBO, Xenoverse, DBH, and movies) to see if alternate timelines can be exploited to still have them fit. Without further ado, let’s begin! 1. New Timelines are created when changes are done in the past which create a paradox. Just using a time machine to travel to the past doesn't instantly create a new timeline. It's when a change happens that creates a paradox. When Trunks traveled the second time back to the past to help fight the Androids, a new timeline wasn't created. In DBS, when Trunks returned, a timeline wasn't created until Beerus hakai'd Zamasu. In Xenoverse, Chronoa taught Trunks how to create time machines that don't have the design flaw which create distortions in time or new timelines. Because of this, the Time Patrol could use time machines and travel multiple times back and forth to fix history. However, note that this doesn't mean that if a change happens in the past, a new timeline isn't created. It isn't dependent on the time machine but on the change. In addition to time machines, the Time Patrol can also use Time Scrolls to travel which also do not create new timelines. 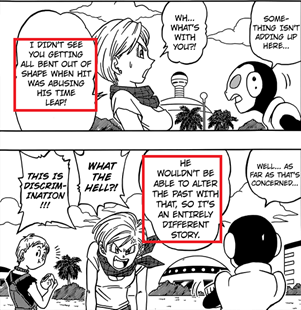 In the manga, a teacher explains Shu, Pilaf, Mai, and Trunks how time travel works. She gives an example in which Trunks goes back in time to give his mom Daifuku (rice cake). 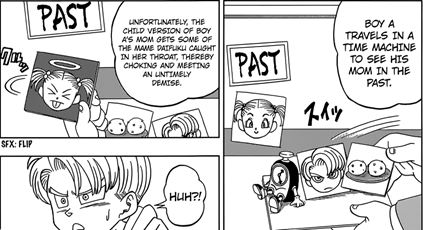 Mom chokes on Daifuku so does not give birth to Trunks. If Trunks is not born, how did he travel back in time to give the Daifuku? This is called a paradox. To rectify the paradox, a new timeline is created in which Trunks is not born but the older timeline in which Trunks is born is still intact. To put it simply, timelines are created to prevent a paradox. A paradox is something self-contradictory like being in two different places at the same time. It can’t occur due to the natural laws of physics, so a parallel timeline is created. Minor changes like killing a butterfly or stepping on poop don’t count as “significant”. Yes, one can argue that minor changes can lead to a “butterfly effect” where a chain of minor events lead to a much more significant event. However, so far in DB logic, this is not the case unless explicitly shown that there is a significant event change. A paradox usually happens when a change occurs in the past. Changes in the future don't create new timelines. (Future Trunks killing Cell in the future, is still a point in the past with respect to his own timeline.) If you travel to the future and kill yourself, a new timeline isn't created because this isn't a paradox. 2. Time rings and Time Scrolls are both natural ways of time travel. Time Rings can only go to the future and then back. They do not create alternate timelines even if changes are done in the future. Gowasu traveled with Zamasu 1000 years to the future to Planet Babari (one of the planets in Prison Planet btw). Zamasu killed a Babarian but no new time ring was created. The effects are applied in the same timeline. Thus, the gods know how to travel in time without creating distortions. We later learned about "Time Scrolls" in Xenoverse which is alternate way to travel in time without creating new timelines. It's the job of the Kaioshin of Time to record history and create these scrolls. If history is altered, then the Time Scrolls will emit a dark energy. Time Scrolls can only be used to travel to the specific point in history that was recorded on the scroll itself. 3. 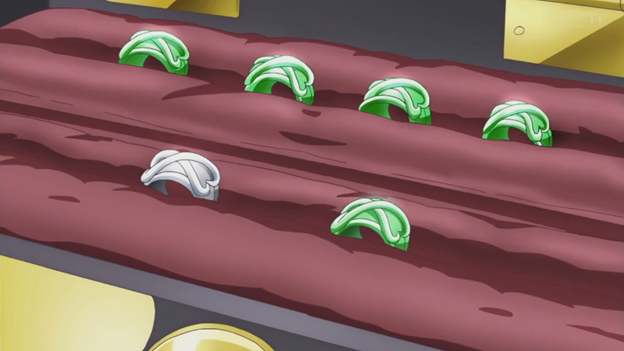 The silver time ring represents the main timeline or the reference timeline while the green ones represent alternate timelines. 4. When a timeline is erased, the time ring also disappears. Even though Zeno erased an entire timeline, Goku was still able to go to it and get Zeno. This is because while the timeline is erased, Zeno himself is not. Zeno exists in an alternate dimension which can still be traveled to by the time machine. Pilaf explained that a time machine can be controlled to visit any parallel timeline and not just 1 by adjusting the frequency. Thus, the time machine can be programmed to a specific frequency to still travel to the place where Future Zeno is even though timeline itself is erased. During the Zamasu arc, we learned that when time passed in the main timeline, the same time passed in the future timeline. In DBZ, Trunks used the time machine the first time to travel from Age 784 to Age 764, August. He spent 1 day in the main timeline, so 1 day also passed in the future. He traveled back to the future, Age 784+1 day. He then spent 1 year (~8 months) in the future to collect the fuel for another trip. It is now Age 785 in the future and Age 765 in the main timeline. He goes back 18 years from Age 785 to Age 767, May 12 (3 years forward from the last trip) because this is the date when the Androids attack. Trunks spent 15 days in the main timeline. Then he leaves on Age 767, May 27 to the future, Age 785+15 days. If he had visited a point before Age 785+15 days, he would create a new timeline, because he would have traveled to a previous point in the future. In DBS, Black invaded the future timeline in Age 795. Trunks spent a year fighting Black and collected enough fuel for another trip. Now it is Age 796 in the future. Thus, 11 years (796-785) passed in the future. Therefore, 11 years also passed in the main timeline also (7 years since Cell+4 years after Buu saga). Trunks took the time machine to the main timeline to Age 779 exactly 17 years before Age 796. We know it's 17 years also since it is stated in the manga. Each time they visited the future (Age 796) to fight Black, the same time also passed in the main timeline (Age 779). In 2013, the Chouzenshuu were released which are 4 books that are the revised and updated versions of the 7 Daizenshuu. 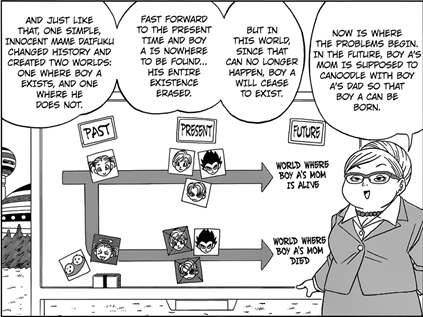 Surprisingly, the Chouzenshuu 4 excluded the fourth timeline - the Unseen Timeline. At first, this might seem good since fans could never explain the Unseen timeline. However, there is now a contradiction with DBS. 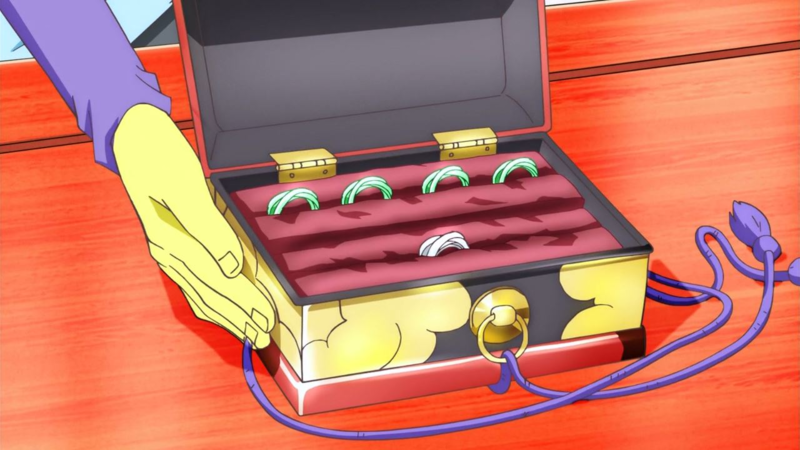 The reason is that when Gowasu first opens the box of time rings, we see 5 total time rings which means 1 main timeline and 4 alternate timelines. If we go by the Chouzenshuu 4, then there are 2 missing timelines. One of them can be explained because it is the timeline created by the Universe 12 time traveler, but what about the other one? Therefore, a fourth timeline is required in order to satisfy the number of time rings shown when Gowasu first opens the box. So we go back to the Daizenshuu 7 and look at the original timeline chart. Note the numbering of the timelines has nothing to do with the order in which the timelines were created. This is just how Toei named them with Timeline 1 always being the main timeline. Main does not mean original though. So let us begin with the original original timeline before any time travel. 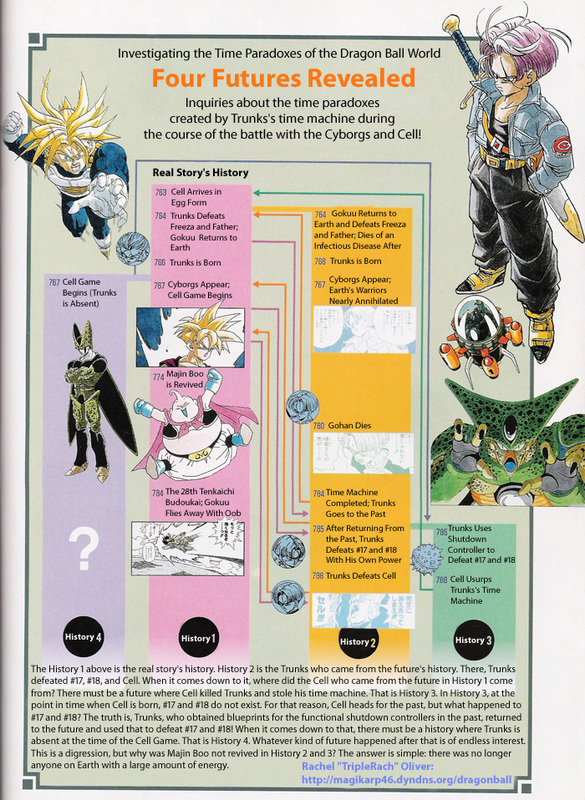 As per the Toei chart, we see that the original timeline is the one from which Future Trunks is from called Timeline 3. 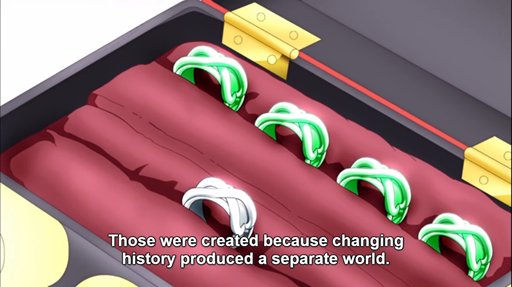 Hence, if we opened the box of time rings, we would only see 1 silver ring. In the future, it takes Trunks one full year (~8 months) to recharge the time machine with Electro Blue no. 15 fuel before he could make another trip. This time, he goes back from Age 785 to Age 767, three years after he last visited. He is not going to a past point in his own timeline, but a future point 3 years later in the main timeline, Timeline 1. Hence, a new timeline is NOT created. In this timeline, Trunks and Krillin find Dr. Gero’s basement lab where the blueprints for Android 17 (Chapter 365). Upon finding these blueprints, Trunks had everything he needed to defeat the Androids in his own future. Trunks immediately went back to his own timeline (Timeline 3) to give these blueprints to future Bulma. 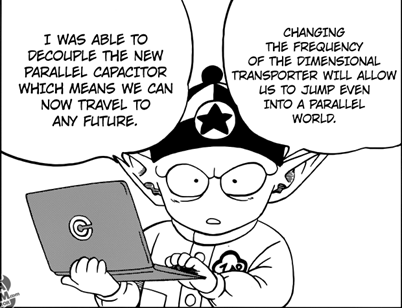 Then, future Bulma was able to create the shutdown controller for Android 17 and 18. Trunks used this to defeat the Androids. Imperfect Cell arrives two years later in Age 788, unable to find the Androids, so he kills Trunks (who did not train with Vegeta in the Room of Spirit and Time) and takes the time machine back to the main timeline, Timeline 1 to Age 763, 1 year prior to when Trunks had arrived. Note that Cell just pressed a button on the Time Machine and had no idea where he was going. It luckily was just set to Age 763. 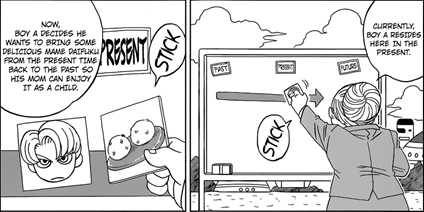 Cell’s arrival in the past creates a significant change in history and that change occurred when Trunks sees the photos of his own time machine and Cell’s cocoon (Chapter 358). This was the trigger and for Trunks to make the decision to not leave and train in the Room of Spirit and Time with his father. In the future, Trunks killed Cell because he trained in the Room of Spirit and Time. He trained because Cell came back in time. Cell came back in time because he killed Trunks in the future. Thus, there is a paradox. To fix this paradox, a timeline must be created where Trunks killed Cell and one where Trunks was killed by Cell. Thus, Cell’s arrival to the past created a paradox, splitting the main timeline again into Timeline 1 and Timeline 4. Now there are 4 time rings total. Timeline 4 has always been one of the biggest mysteries in DBZ. Many fans believed that the Daizenshuu 7 made a mistake in this timeline. Cell arrived in Age 763, 1 year before Trunks first arrived. The Daizenshuu stated that in this timeline, there is a Cell Games without Trunks, but how can that happen? If Cell came from the future, stealing Trunks’ time machine to go to a single timeline, then how can he be in two different timelines? That is, where did this other Cell come from? Even the Chouzenshuu excluded Timeline 4 because it didn’t make sense. There's a way to make this work without contradicting anything in the guidebooks. 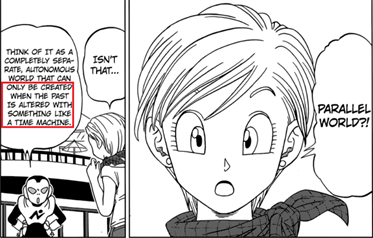 If we want to keep the things the way they are as stated in the Daizenshuu 7, then there is a Cell Games without Trunks. A timeline is created when a paradox is created. Therefore, the paradox happens once Trunks decides not to leave right? If Trunks doesn't leave, then Cell can't go back in time but if Cell leaves then photos of his cocoon are taken. This is a paradox. The reason the timeline isn't split after Cell arrives but rather after Trunks sees the photos is because there isn't a paradox yet. Cell is hibernating in his cocoon for 3 years and doing nothing to create a paradox. So basically, there are two timelines - one in which Trunks stays and trains and one where he leaves with the blueprints. In this timeline, Trunks leaves with the blueprints of Android 17 to the future. This would generate a Cell Games without Trunks. No Trunks means Vegeta doesn't go on a rampage and Gohan doesn't lose his left hand saving Vegeta. Gohan finishes Cell using a two-handed Kamehameha. Everything else would happen normally - Buu Saga, BoG, RoF, U6 arc, etc. Zamasu would wish to switch bodies with Goku, becoming Black. He would leave to Timeline 3. This would leave this timeline without a Goku. No Goku means no Tournament of Power. The universes with the lowest mortal level are erased. In Timeline 4 (Unseen), there is no Cell Games at all which avoids the two different Perfect Cells confusion. In this theory, the timeline was split after Cell went to the past, splitting the main timeline into one with Cell and one without Cell. Goku lives and fights with Trunks to defeat the Androids together. However, Trunks needed to find a weakness and strategy to defeat them in his own future. He finds Dr. Gero's basement lab and finds 17's blueprints. Trunks leaves with the blueprints upon finding them in hopes that Future Bulma can create a remote shutdown controller from them. Kami never fuses with Piccolo due to the absence of the threat of Imperfect Cell. The Z senshi don't train in the Room of Spirit and Time. The Dragon Balls are still gathered to revive those killed by the Androids. Dende never becomes the new guardian and Shenlon remains the same with the ability to only grant 1 wish. Since there is only 1 wish, it is used to revive those killed by the Androids. Gohan never turns SSJ2. Goku does not die and hence, the North Kaio also does not die. Goku never participates in the Afterlife Tournament (filler) or learn fusion dance from the Metamorans. Goku and Vegeta continue to train and fight during the 7 years, each reaching SSJ2. Everyone is weaker due to the lack of the Cell Games. Piccolo may decide to merge with Kami due to the threat of Buu which then makes Dende the new guardian. Vegeta may not allow himself to be taken over by Babidi to become Majin during the 25th Tenkaichi Budokai because he has closed the gap between him and Goku. Gohan is a lot weaker, never having trained in the RoSaT or achieving SSJ2. However, he would still achieve the same power as Ultimate Gohan after the Elder Kai unlocks all his latent ability. Subsequent events with Buu’s revival, BoG, RoF, U6 tournament, and the Zamasu arc occur as normal. Zamasu does become Black and kill Goku’s family, leaving the timeline. Without a Goku in this timeline, there is no Tournament of Power. There is only 1 Zeno. Zeno may get bored and erase the 8 universes with the lowest mortal level. After the Cell games in Timeline 1, Trunks goes back to his future. Since he trained with Vegeta, he was able to kill both the Androids and Imperfect Cell easily with his own power, thus creating a new paradox. The paradox being that if Imperfect Cell is killed by Trunks, then he can't go to the past. Hence, the future timeline is split into Timeline 3 (original) and Timeline 2 (New Future Timeline). Now there is a total of 5 time rings. (Note that in the expanded DB universe, Chronoa, the Kaioshin of Time, at this time recruits this Future Trunks (purple hair) to become a Time Patroller). Later, this timeline is erased by Zeno. Timeline 1 - Main Timeline. Cell Games with Trunks. Trunks decides to stay and train in the Room of Spirit and Time. Timeline 2 - New Future Timeline. Trunks kills Android 17, 18, and Cell with his own power. Timeline 3 - Original Timeline. Trunks gives blueprints to future Bulma to make a remote shutdown controller. Trunks uses remote to defeat Android 17 and 18. Cell kills Trunks and takes the time machine. Timeline 4 - Unseen Timeline. Cell Games without Trunks. Trunks leaves with the blueprints he finds from Dr. Gero's basement lab and returns to Timeline 3. Timeline 5 – First Alternate Timeline. A mortal from Universe 12 used the first time machine in history to go to the past. With me so far? Everything I've told you so far is consistent with the facts in the manga, anime, and Chouzenshuu 4. We kept a fourth timeline but we removed Perfect Cell from it fixing Daizenshuu’s 7 mistake. Now let's begin with Dragon Ball Super. 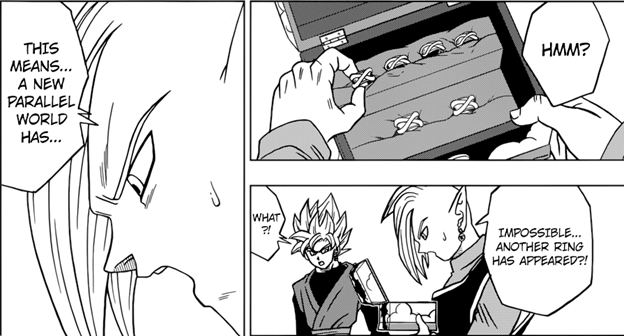 Gowasu opens the time ring box for the first time (Chapter 17, page 9 and Episode 49) and what do we see? We see 4 green time rings and 1 silver ring. That's a total of 5 rings or 5 timelines. This is exactly what we got! Gowasu further comments that someone has created a new time ring recently since he last opened the box. 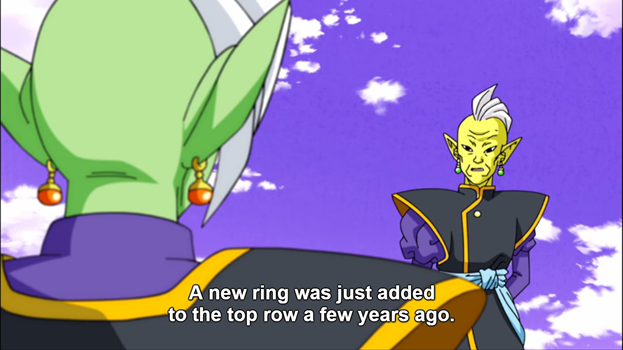 In the anime, he said a new ring was added just a few years ago. If it was created a few years ago, then it couldn’t have been caused by Trunks arriving with the time machine now in the Zamasu arc. This means that the last time ring had to be created from the Cell Saga when Trunks used his time machine for the third time in Age 767, a few years before Age 779 which is when the Zamasu arc started in DBS. Let’s continue. So after the events of the U6 Tournament, Zamasu learns of Goku from watching GodTube. He goes to Zuno and learns everything about the Super Dragon Balls. He kills Gowasu, taking the time ring. Then he gathers the Super Dragon Balls and wishes to switch bodies with Goku to become Black. Then kills Goku and his family. Now to escape Beerus, he needed to travel to a timeline where there is no Beerus. Thus, he traveled to Timeline 2 – the Future Trunks timeline. In Timeline 2, after Trunks killed Cell. A few years later, Babidi and Dabura arrive. Trunks trains with Shin, achieves SSJ2, and kills Dabura with Shin dying in the process, which also kills Beerus. Thus Timeline 2 did not have a Beerus and Black could carry out the Zero Mortals Plan. He found Future Zamasu, helped him kill Gowasu, taking another time ring. The two Zamasus gathered the Super Dragon Balls, but since Goku was not alive in this timeline, Future Zamasu instead wished for immortality! It works out to Black’s plan because he needed Zamasu to use his healing powers to get zenkai boosts. From the zenkai boosts, Black learns Goku’s body more and makes it his own. Future Trunks from Timeline 2 eventually escapes back to Timeline 1. Remember a new timeline still has NOT been created! Trunks warns Goku of Black. They eventually figure out that Zamasu is behind the whole thing so Beerus hakais him. THIS causes a significant change, splitting the main timeline again to Timeline 1 and Timeline 6 with the latter being the timeline from which Zamasu is alive and successfully becomes Black. Beerus thought that using hakai on present Zamasu would eliminate all versions of that Zamasu in other timelines but he was wrong. It only made matters worse by creating a new timeline and time ring, giving us a total of 6 time rings, 5 green and 1 silver. 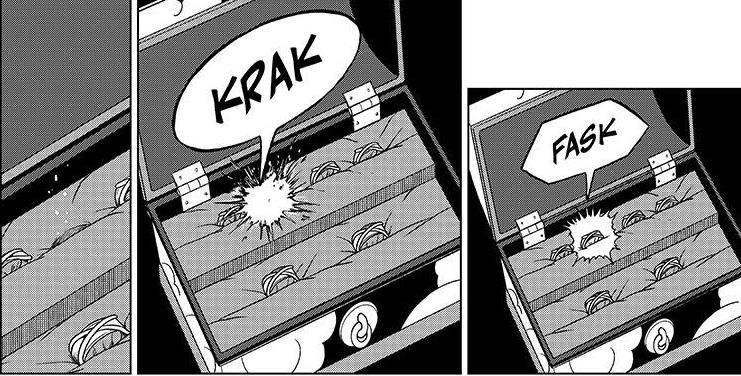 Then, when Zeno sama erases the entire Timeline 2 (Future Trunks’ timeline), one of the time rings disappears from the box as shown in the manga, Chapter 26. So now there’s 5 time rings total. So if the timeline is erased, how can Goku still travel back to it to pick up future Zeno? Even though the natural way to travel (the time ring) to the timeline is gone, it is still possible to use a time machine to travel to the specific location of Future Zeno since the settings of the time machine were already tuned to a specific frequency that corresponded to the erased timeline. This was explained by Pilaf. But we aren’t done yet! In the end, Trunks and Mai decide that they want to travel back to the future before Dabura and Zamasu. Whis and Beerus give them permission to do so. This splits the future timeline into Timeline 2 and Timeline 7 which the former is erased and the latter has two pairs of Trunks and Mai. Whis travels to this timeline to wake up future Beerus early and warn him of Zamasu. 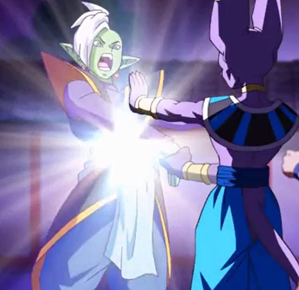 Zamasu is sealed by Beerus permanently. This chart only shows the anime version of events but without the manga, we would get a time paradox. Zamasu becomes evil after losing to Goku -> Goku fights Zamasu because Trunks -> Trunks travels back in time because of Black -> Black is created by Zamasu after he becomes evil. This creates a never ending loop! We don’t know the start point. In the manga, we know that even without Goku, it is GodTube that is the start point. Now for the fun part – theory. There is an expanded DB verse that is beyond just anime and manga. It includes Dragon Ball Online (DBO), movies, OVAs, Xenoverse, Dragon Ball Heroes (DBH), and other video games. Apart from DBO, most of these are considered to not be “canon”. Now a lot of people do not like to use the word, “canon”. Rather, it’s better to look at “continuity”. That is, is there a way to fit the above possible stories without contradiction? The Daizenshuu 6 has tried to place the movies in the timeline. There are only two timelines available for us to use for these other stories – Timeline 4 (Unseen) and Timeline 5 (First Alternate Timeline). The latter is a blank slate which means we can make it whatever we desire. 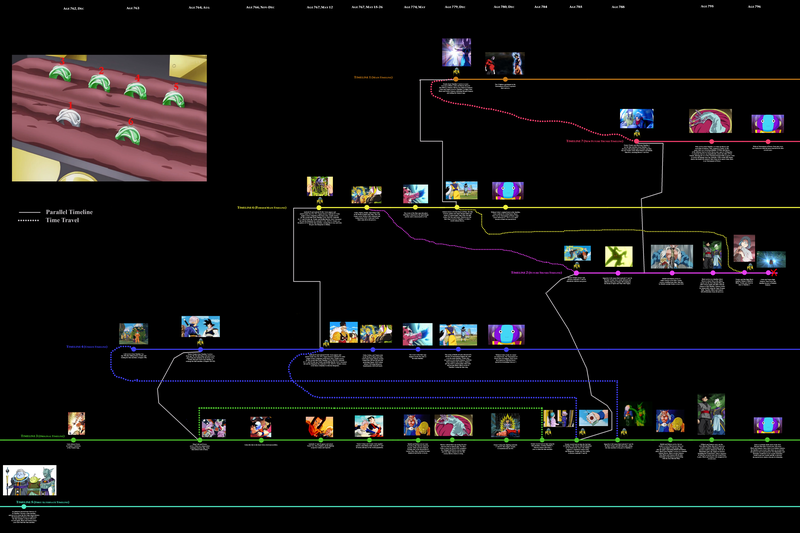 I will try to see with logic, if it is thus possible to fit in the expanded DB verse using these two timelines. Timeline 1 (light blue) – Main Timeline, the one we watch on tv; Created when Beerus hakai’d Zamasu. Goku is alive. Universe 7 wins the Tournament of Power. You know this story already. This is the main timeline so it has to be consistent with the manga and anime. DB Minus occurs in this timeline instead of the Bardock OVA. After Gine and Bardock send Goku to Earth, Bardock makes a last stand against Freeza in space. This allows both DB Minus and the two panels in chapter 307 in Freeza’s flashback to be canon. Fillers like the Garlic Jr. saga after Freeza as well as the Afterlife Tournament can still be placed and not contradict anything within the story. Therefore, Movie 1 can be placed after the 23rd Tenkaichi Budokai and before Raditz arrival. The remaining movies have to be placed in different timelines. Movies 2-4 can't occur because during the Saiyan saga with Goku having knowledge of Kaioken but the Z senshi haven’t been killed by Nappa yet so there is a contradiction. Movies 5-6 could occur during the 3 year gap before the Androids however, Freeza does not mention his brother once even after considering to revive his father in Revival of F. Movie 7 can’t fit either as it occurs shortly after Android 17 kills Dr. Gero but before Cell. Movies 8, 10, and 11 can’t occur since Goku and Vegeta never mention Broly’s name even after seeing Kale’s transformation, implying it is the first time they are seeing something similar. Movie 9 can indeed occur immediately after the Cell Saga. Movies 12 and 13 are difficult to place due to its timing in the middle of the Buu saga. Vegeta is dead in Movie 12 and missing in Movie 13, so it can’t be logically placed after Buu saga either. The events of Abo, Cado, and Tarble can also be placed after the Buu saga. Events of DBO, Xenoverse, and DBH can still occur as they take place many years after the end of DBZ. Around Age ~850, Towa along with Mira, begins collecting kiri (energy) in order to break the seal of the demon realm to free her comrades. To do this, she creates time anomalies she creates in history by creating portals through time with dark magic. Chronoa notices these anomalies and thinks they are the result of Future Trunks again messing with time, so she summons Trunks from Timeline 7. To redeem himself and help Chronoa, he assumes the role of Xeno Trunks and together, create the Time Patrol. Towa creates a portal to send Bardock in Timeline 5 back in time just before he was killed by Freeza. This causes Bardock to fall on Planet Plant, and the events of Episode of Bardock begin. After Bardock kills Chilled, Towa and Mira together capture Bardock and brainwash him using a Dark Mask, turning him into Time Breaker Bardock. The Mask increased Bardock's power. Chronoa and Trunks are able to find Towa and Mira. SSJ Trunks defeats Bardock, enough to break his mask. Bardock and Trunks together then defeat Mira but Towa and Mira escape. The tampering with time due to Towa, weakened the barrier between dimensions and freed Demigra from the Crack of Time. The events of XV1 occur. To help Trunks, Chronoa also summons Xeno Goku from Timeline 5 (GT) 60 years after the defeat of Omega Shenron where Goku now has an adult body. Xeno Goku trains Trunks, which causes Trunks to achieve SSJ3 but can only maintain the transformation for 10 seconds. In addition, Xeno Goku teaches him the fusion dance so that he can perform it later if needed. The events of the Dark Demon Realm saga begin. Eventually, enough kiri is collected to break the seal of the Demon Realm, freeing Mechikaboola, the ruler of the Demon Realm. Towa and Mira brainwash Dende from the future to create another set of Dragon Balls, called the Dark Dragon Balls. Chronoa summons more characters such as Xeno Goten, Xeno Vegeta, and Xeno Gohan, all from Timeline 5 (GT) to help. Mechikaboola successfully wishes for his youth. Chronoa uses her magic to seal herself and Mechikaboola in another dimension. With the entire Dark Demon army sealed, Demigra begins to carry out his plans without any problem. Xeno Goku investigates an anomaly created by Fu, Towa and Mira's artificial son. The events of Universe Mission Prison Planet Saga begin. Using his knowledge of magic, Fu finds the most powerful binding spell in history and uses it to chain 7 planets together, creating the Prison Planet. Fu also gathers the Dragon Balls from Earth from the past and brings them to the Prison Planet. Fu then captures prisoners from different eras in time including an ancient Saiyan from Planet Sadala in Universe 7, named Cumber. He uses the energies he already gathered from time rifts and experiments on Cumber, making him stronger. He lures Xeno Goku to the Prison Planet, hoping to imprison him there. Meanwhile in Age 780, the Tournament of Power has ended with Universe 7 being victorious. All the universes have been wished back. Goku and Vegeta are training with Whis. Trunks and Mai visit them and also joins in on the training but is captured by Fu on his way back in Timeline 7. This causes Goku and Vegeta from Timeline 1 to rescue Trunks. Eventually, the chains that held the Prison Planet together break from the fight between Cumber and Xeno Vegito. After the events of the Prison Planet Saga, Goku and Vegeta return to their timeline (Timeline 1) and resume training. Freeza arrives in a spaceship with Paragus and Broly. The events of the DBS Broly movie begin. 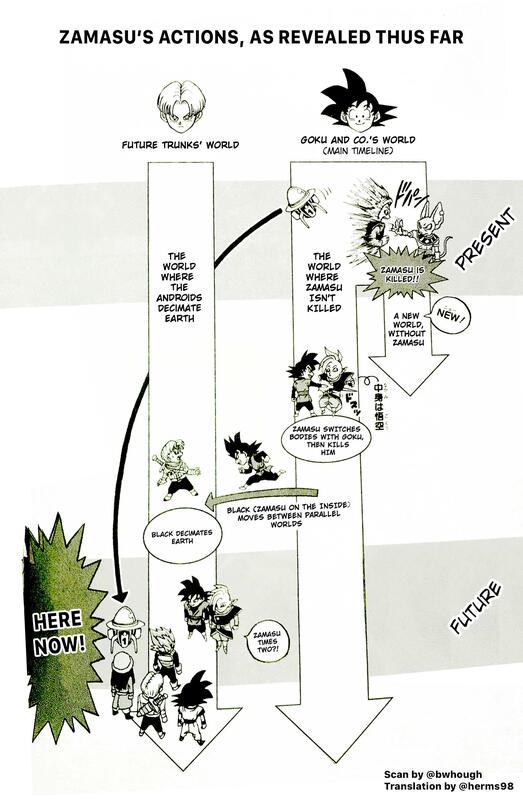 Timeline 2 (green) – Future Trunks Timeline, erased by Zeno. Created when Trunks kills Imperfect Cell in the future. Trunks kills Android 17, 18, Cell, and Dabura. Shin is killed by Babidi causing Beerus to die. Black invades this world, kills Gowasu and recruits Future Zamasu. Goku and Vegeta from Timeline 1 fight Black and Zamasu. Eventually, Infinite Zamasu happens and Zeno to erases the timeline. The History of Trunks as per the manga occurs here. Goku dies of the heart virus in Age 766, 2 years after he arrived and killed Cold and Freeza. Six months later, Androids 17 and 18 attack South City. Thirteen years later, Gohan loses his left arm. Trunks turns into a Super Saiyan after seeing Gohan's lost arm. Towa and Mira wake up Future 16. Future Warrior and Gohan defeat 16. Trunks: Xeno defies Chronoa and tries to save Gohan from the Androids, creating a new timeline. Chronoa erases that timeline and keeps the original timeline in which Gohan dies. Gohan remembers that one day Trunks will be the savior. Timeline 3 – Original Timeline, Future Trunks uses shutdown remote controller to destroy Android 17 and 18. Imperfect Cell kills Trunks and takes the time machine. There are no strong fighters left on Earth. Buu is not revived due to lack of sufficient energy. All the Z senshi are dead in this timeline. Babidi and Dabura would spend years trying to collect energy to revive Buu. Shin and Kibito would succeed in halting Buu’s revival but Shin still is killed by Dabura. This kills Beerus. Black from Timeline 4 arrives to this timeline since it has no Beerus and recruits Zamasu. Black kills the other 11 Kaioshins and proceeds with the Zero Mortals Plan to kill all mortals in all 12 universes. Black never reaches the full potential of Goku's body because there are no strong fighters left (no SS Rose). They rule unopposed until Zeno is aware of what has happened. Zeno does not erase the timeline since there is no Infinite Zamasu but instead erases Black and Zamasu and universes with low mortal level. At this point, new Kaioshins are appointed and life is created to increase mortal level which is the job of a Kaioshin. Timeline 4 – Unseen Timeline. Trunks arrives a second time and takes the blueprints from Dr. Gero’s basement lab to his own timeline, Timeline 3, never training in the Room of Spirit and Time. Cell Games may or may not occur. Created when Trunks first travels back in time to give Goku the heart medicine. Events of the Buu saga, Battle of Gods, Revival of F, and Zamasu arc occur as in Timeline 6. After Future Trunks has given Goku the heart medicine, the Z senshi train for 3 years. During this period, Movie 5 and 6 occur; Cooler is killed. Vegeta is off world trying to become a SSJ which explains his absence in Movie 5. Future Trunks returns 3 years later (Age 767). Android 17 kills Dr. Gero after he wakes up. This prevents Dr. Gero from doing additional tweaks to Android 17 and 18 which make them weaker than their main timeline counterparts. Android 16 is not activated in this timeline. Due to the lack of influence of Android 16, Androids 17 and 18 are more hostile. They appear in South City instead of Dr. Gero and Android 19. Together with Trunks, three Super Super Saiyans defeat the Androids. Later, the Super computer in the basement activates Androids 13, 14, and 15, who are much weaker than 17 and 18. The events of Movie 7 occur and Super 13 is defeated. Trunks locates Dr. Gero’s basement lab and the blueprints for Android 17. There is no Cell Games. The Z senshi do not train in the ROSAT. The events of “Dragon Ball Z: VRVS” occur after the Androids. Goku and Gohan train together where Gohan learns SSJ. Ozotto is defeated. Paragus arrives to Earth and invites Vegeta to come to New Planet Vegeta. There, they meet Broly but the Trunks that participates has not trained in the RoSaT. Hence, this is different from the exact events of Movie 8. The Z senshi are easily defeated. With Broly almost about to kill Goku, Gohan temporarily turns SSJ2 and hits Broly, weakening him. Goku takes the opportunity to absorb all the remaining energies from his friends. He uses a Super Kamehameha to send Broly into space. Broly drifts in space for 7 years frozen in ice. Trunks takes these blueprints to his future timeline where a remote controller is developed by Future Bulma. He is killed in Timeline 3 by Imperfect Cell. Kami decides not to fuse with Piccolo. Since there is no Cell Games, a hooded figure collects the Dragon Balls to revive Freeza. The events of “The Real 4-D” occur. Goku kills Freeza once more with a massive Spirit Bomb. The events of the Buu saga occur which force Piccolo to fuse with Kami. Dende becomes the new guardian. Battle of Gods, Revival of F, and the Universe 6 arc occur as normal. After the events of the Universal 6 tournament, the events of “Dragon Ball Z: The Real 4-D at Super Tenkaichi Budokai” occur. A battle royale tournament is held on Earth where people aboard a Capsule Corp. ship watch. Broly God interrupts them who has appeared suddenly. Thanks to Shenron, Goku performs God Fusion with the people on the Capsule Corp. ship. He finishes God Broly with a Kamehameha. Later, Zamasu watches Goku on GodTube. Zamasu succeeds in wishing to switch bodies with Goku, to become Black and leaving this timeline to Timeline 3. Zeno is alone and has no friend, which Goku had promised earlier. Without a Goku in this timeline, there is no Tournament of Power. Zeno erases the 8 universes with the lowest mortal level. Timeline 5 – First alternate timeline. This timeline was created by the actions of an unknown mortal from Universe 12 from Timeline 3 using the very first time machine in history. This time machine was later confiscated by the Universe 12's kaioshin. Black and Zamasu found this time machine in Timeline 2 after killing the kaioshin and planned to use it to follow Goku and co. as Infinite Zamasu. We don't know anything about this timeline, so it's free for our imagination. 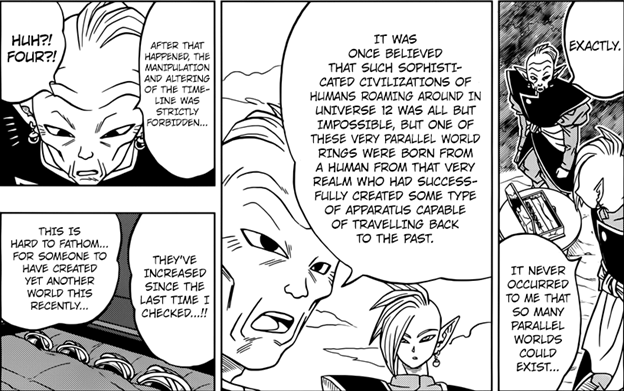 Let us assume that the change the mortal from Universe 12 made, caused a ripple, affecting space-time which also affected Universe 7’s history. The first change, altered Planet Sadal's history 238 years Before Age. Yamoshi turned into a SSJ and then into a Golden Oozaru. He was outnumbered and defeated but his spirit never wandered. Thus, Namekian book of legends did not record or foretell a SSG. Thus, the prophecy the Oracle Fish made changed. Beerus never set an alarm clock to wake up 39 years later nor dreamed about the SSG and kept sleeping. In this timeline, the events of DB Minus did not occur. Instead, Gine dies from childbirth. This causes Bardock’s personality to change. He becomes more ruthless and more ambivalent toward his son, Kakarot. The events of the History of Bardock TV Special occur. At this time, Kakarot’s crying also irritates baby Broly. Bardock is transported to the past just before he is killed by Freeza’s death ball due to magic by Towa. The events of the Episode of Bardock occur with Bardock becoming a SSJ and defeating Chilled on Planet Plant. Towa later abducts this Bardock, using her science to further strengthen and brainwash him to becoming Time Breaker Bardock. The first three Dragon Ball movies occur in this timeline. The second change - Goku attacks the Red Ribbon Army earlier based on the events of the 10th Anniversary Dragon Ball movie, "The Path to Power". Dr. Gero's son, who looked exactly like Android 16, was a soldier of the Red Ribbon Army, and was killed in crossfire during the battle with Goku. Enraged at this, his research on Cell began sooner and started to collect the DNA of different fighters. The Z senshi fight the Androids but now with SSJ Goku’s help. They are still defeated. Goku uses the Shunkan Ido to strategically retreat and transport the Z senshi to Kami’s lookout. The infinite energy model Androids are unable to sense ki and hence cannot detect where Goku is. Meanwhile, Cell continues to grow uninterrupted in Gero’s basement lab as it was never discovered. He is at a much advanced stage of development due to Dr. Gero’s research on him starting earlier. Due to this, Imperfect Cell comes out a few days after the Androids. Imperfect Cell confronts the Androids eventually. Kami decides to fuse with Piccolo much earlier than the main timeline to help face a greater threat than the Androids - Cell. Due to this, the Dragon Balls are inactivated. Pilaf, Shu, and Mai’s plans get delayed and they do not collect the Dragon Balls to wish themselves youthful. Piccolo together with Android 17 face Imperfect Cell. 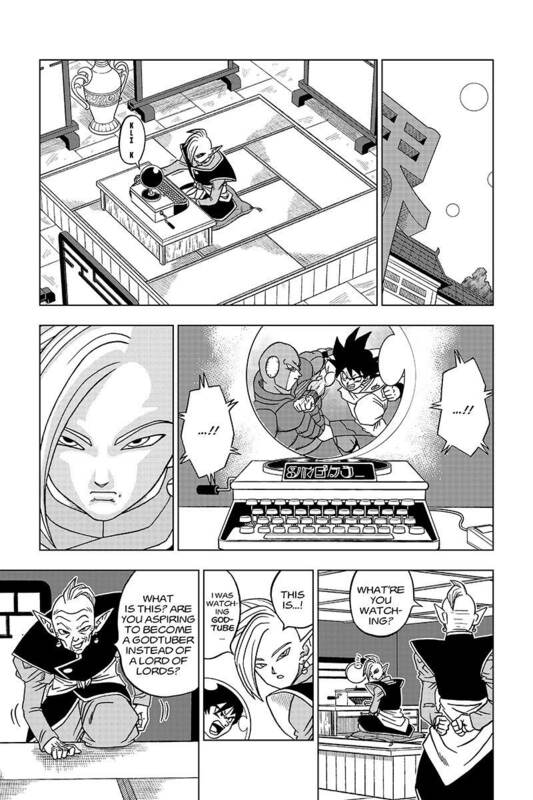 While Piccolo buys some time, Goku informs his friends of the Room of Spirit and Time (RoSaT), in which he had previous knowledge of when he trained with Kami in Dragon Ball. The chamber can only be entered for two days (actual) or two years (RoSaT) but there is only enough food for 2 people for 1 year. Goku wants to train with Gohan, so he allows Vegeta to enter for 1 day. Goku and Gohan follow after. Imperfect Cell successfully absorbs 17, turning into Semi-Perfect Cell. Vegeta comes out of the RoSaT, and easily defeats Semi-Perfect Cell. Due to his ego, he allows Cell to absorb 18 as well despite best efforts from Krillin and Tien to prevent him. The 10-day wait of the Cell Games begin. Meanwhile in the future, Future Trunks from Timeline 2 has killed Imperfect Cell and the Androids. Chronoa, the Kaioshin of Time, has already recruited Trunks to join the Time Patrol. Trunks helps Chronoa by preventing Mira and Towa from messing with time. The actions of the Time Patrol all happen outside of time since the Time Nest is a dimension outside of the 12 universes or time and space. Chronoa teaches him how to build time machines so that they do not create new distortions or timelines. Eventually, after a year in his own time, Future Trunks (purple hair) goes back in time to visit his friends, but instead of returning to the main timeline, he ends up here in Timeline 5 because the settings for the time machine got changed after it was upgraded by Chronoa. He re-introduces himself to the Z senshi and explains who he is. Eventually, Paragus arrives to Earth and invites Vegeta to Planet New Vegeta, starting Movie 8. Broly is defeated by Goku absorbing the energies of Trunks, Gohan, Piccolo, and Vegeta. Broly then floats in space, frozen in ice for 7 years. Meanwhile, Dr. Raichi, a scientist who is a survivor of the Tsufuru-jin race from Planet Plant, devises a plan to get revenge on the Saiyans. He puts devices on Earth that emit Destron Gas. Mr. Popo finds out and informs the Z senshi a few days after Movie 8. Thus, the OVA, “Plan to Eradicate the Saiyans” occurs. The ghost warriors – Kooler, Freeza, Slug, and Turles, all of who have appeared in this timeline before are defeated again. The final boss - Hatchiyack is defeated. Future Trunks does not stay to participate in the Cell Games a second time. As he is afraid that knowledge of the future may change the outcome, he does not inform the Z senshi how Perfect Cell is killed or about Goku’s death. Future Trunks spends another year helping Future Bulma rebuild West City. Meanwhile, in this timeline, the Cell Games occur but without Trunks. SSJ2 Gohan does not lose his left arm protecting Vegeta due to the absence of Trunks. He kills Cell using a Kamehameha with both hands. Goku and North Kaio still die, freeing Bojack from his prison, starting Movie 9. A few months later, a world martial arts tournament is held. Future Trunks has collected enough fuel for another final trip to the past and arrives again as confirmed by Bulma in the movie. Future Bojack is defeated by SSJ2 Gohan. Future Trunks returns to his timeline. Goten and Trunks find Broly frozen in ice. Movie 10 occurs before the start of the 25th Tenkaichi Budokai. Spopovich and Yamu take the energy from SSJ2 Gohan. This causes Shin, Kibito, and the Z senshi to leave the tournament. The 25th Tenkaichi Budokai ends with Mr. Satan the winner and Android 18 the runner-up. Movie 11 starts with Android 18 is asking Satan for the prize money. Bio-Broly is defeated by salt water with the efforts of Android 18, Goten, and Trunks. Meanwhile, Goku, Vegeta, and Gohan fight Babidi’s warriors in his spaceship. Unlike the main timeline, Gohan loses in rock paper scissors and fights Pui Pui first. Vegeta fights Dabura. Due to this, Vegeta does not get irritated by Gohan and is able to keep his composure for a longer period. The fight continues until Dabura realizes that there is a hint of evil ambition inside Vegeta. He tells Babidi to exploit it. Vegeta allows himself to become Majin to close the gap between him and Goku. The events of the Buu saga occur with Vegeta sacrificing himself in an attempt to kill Fat Buu. In the end, when Porunga is summoned, Vegeta is not revived by Porunga and continues to stay dead and have a halo. Goku finishes Kid Buu with the Spirit Bomb. Movie 12 happens with Goku meeting Vegeta in the afterlife, fusing to Gogeta and defeating Janemba. (This allows for Vegeta to know the Fusion Dance to be later used in GT.) Movie 13 also occurs with the defeat of Hirudegarn by SSJ3 Goku’s Dragon Punch. Vegeta is absent from Movie 13 since he’s still in Hell. (Goku later uses Dragon Punch in GT.) At the end of the Japanese version of Movie 13, the Z senshi bid farewell to Tapion and state that they will wish to revive the good people that died recently via Shenlon. This causes Vegeta to also be revived as now his deeds after Movie 12, deem him pure of heart. The events of “Yo! Son Goku and His Friends Return! !” occur as normal with the arrival of Abo, Cado, and Tarble. Goku leaves to train with Uub after the 28th Tenkaichi Budokai. Pilaf, Shu, and Mai’s plans to gather the Dragon Balls resume. 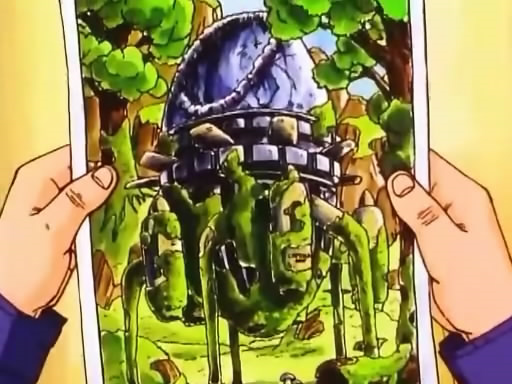 Instead of searching for all 7 one by one, Pilaf’s radar detected that there is a set of Dragon Balls already gathered at Kami’s lookout, the Black Star Dragon Balls, created by the Nameless Namekian. Pilaf and his gang sneak into Kami’s lookout, find the Black Star Dragon Balls, and wish for Goku to be a kid again. This starts GT! Omg guys, we actually did it! Movies 1-6, 8-13, Plan to Eradicate the Saiyans, Bardock OVA, and GT can all fit in this timeline. Many years later after the defeat of the Evil Shenrons, Earth is at peace. Goku and Vegeta continue to train independently. Goku now has an adult body. He gets summoned from this timeline to the Time Nest by Chronoa. Vegeta, Gohan, and Goten also get summoned from this timeline and join the Time Patrol to help Chronoa fix time anomalies. Timeline 6 (dark blue) – Former main timeline, Zamasu switches with Goku’s body to become Black, kills Gowasu and Goku, and takes the time ring to Timeline 2. Created when Cell travels back in time which causes Trunks to see the photos of his time machine and Cell’s cocoon, prompting him to stay and train. Created when Future Cell uses the time machine to travel back in time. Trunks does not arrive from the future to warn about Zamasu. After the end of the U6 tournament and before the Zamasu arc begins, a supercomputer in one of Dr. Gero's lab wakes up Android 21, who is an android modeled from the human who was Dr. Gero's wife. She gradually gains memories of her human version and learns that Android 16 was modeled after her son, so she creates a new Android 16 model. The events of FighterZ occur, particularly the "Android 21 arc" variation of the story. Android 21 splits into an evil clone of herself. Good Android 21 and Evil 21 are both destroyed by the Spirit Bomb. Zamasu finds out about Goku from GodTube. He learns about the Super Dragon Balls from Zuno. He kills Gowasu and then wishes to switch bodies with Goku to become Black. He then uses the time ring to travel to Timeline 2. Without Goku's body, Goku cannot be wished back using the Dragon Balls. There is no Tournament of Power. Zeno erases the 8 universes with lowest mortal level. Timeline 7 (brown) – New Future Trunks Timeline. Created when Trunks and Mai travel from Timeline 1 to before Dabura. Whis from Timeline 1 wakes up Beerus early and warns him of Zamasu. Zamasu is sealed permanently. There is no Black in this timeline. There are two pairs of Trunks and Mai. Dabura is defeated, Shin lives and hence, Beerus lives. Paragus and Broly still live in Planet Banpa but since Freeza is not alive, there is no reason for them to come to Earth. Whis has awoken Beerus early and warned him of Zamasu. In order to prevent Shin’s death at the hands of Dabura and Babidi, Beerus may just eliminate them himself. Future Trunks (blue hair) and Mai (from Super) live together in peace. The other Future Trunks (purple hair) lives with Future Bulma. He has not met Mai since the events of Black never happened. In Age 788 of this timeline, Future Trunks (purple hair), has just killed Imperfect Cell. In the future (~Age 850), Chronoa, the Kaioshin of Time, transports the Future Trunks (purple hair) from Age 788 to the Time Nest, a dimension that exists outside of the 12 universes and time. She scolds Trunks (purple hair) for using the time machine and creating multiple timelines. It is found that he is not responsible for the time anomalies created in Age 850 but Towa and Mira are. In order to make up for it, this Trunks (purple) joins the Time Patrol and helps Chronoa fix the time anomalies. Thus, he becomes “Xeno Trunks”. Chronoa searches Xeno Trunks' memories to summon the strongest warrior. She summons Xeno Goku from Timeline 5 after the events of GT. Xeno Goku trains with Xeno Trunks. Thus, the events of Xenoverse and DBH occur – Dark Demon Realm saga and Dark Empire saga. Xeno Trunks eventually learns to become SSJ3 not SS Rage. Demigra is defeated and sealed back into the Time Chasm. Mechikabura restores his youth using the Dark Dragon Balls but is sealed by Chronoa. These events are occurring in the future of the main timeline ~ Age 850 but the Xeno characters are recruited for the Time Patrol from different timelines and eras. Most of the Z senshi have died of old age by Age 850. Future Trunks (blue hair) gets bored and visits the main timeline to train with Goku and Vegeta (after the Tournament of Power). He suddenly disappears. Fu has kidnapped him and taken him to the Prison Planet. Goku and Vegeta go back to Timeline 7 and try to rescue him with the help of Mai. Thus, the Prison Planet arc begins. Q: When Goku and co. used the time machine to travel back and forth multiple times to fight future Zamasu and Black, why didn’t that create new timelines? A: No new paradoxes were created, so no new timelines were. Simply visiting the future and going back did not create any new paradoxes so there were no new timelines. Just by using the time machine alone doesn’t create new timelines. A change has to occur which leads to a paradox. Q: What about a timeline in which bla bla bla happened? A: Theoretically, there are an infinite number of parallel and “what if” scenarios, but we are limited by the number of time rings shown. New time rings may have been created in the future, but as of Age 780 in DBS, there are only 7 timelines, 1 of which is erased. Also, Trunks traveling back a second time, did not significantly alter the order of events. With or without him, Cell and the Androids would have been defeated. Timelines can be complicated so even Toei and Akira Toriyama can lose track of them! Q: So what about Hit’s Time Skip, does that create new timelines? 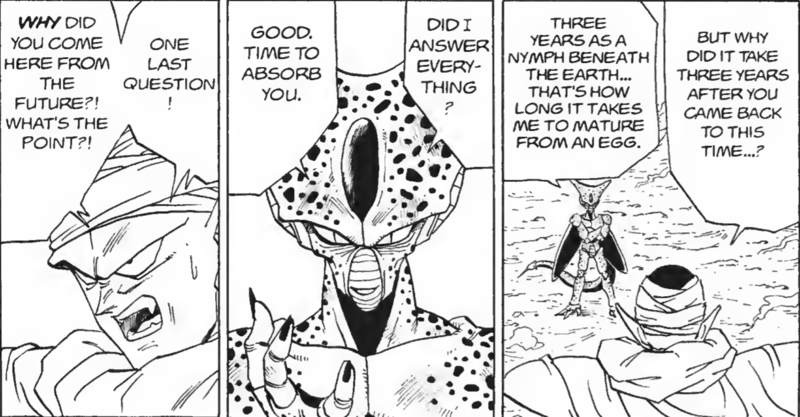 Q: When Whis turned back time to 3 mins to prevent Freeza to destroy the Earth, is there a timeline that exists which Freeza did destroy the Earth? A: Well, we are in luck because Bulma asked the same question to Whis! Short answer: No, Whis's redo technique doesn't create a new timeline, it's simply rewinding time. Q: There were so many changes to history by Mira, Towa, Fu, and Demigra. Why didn't these actions create new timelines? A: Those Time Rifts were fixed by the Time Patrol. Chronoa has the ability to merge timelines and also remove them. Hence, the number of total timelines did not change. In addition, demons use dark magic to travel through time and change history. This is a method of time travel similar to using the time scrolls rather than an artificial time machine. Last edited by shadowfox87 on Tue Apr 23, 2019 7:48 pm, edited 48 times in total. I read through all that and I still don't get the incessant need to find the origin of these time trips. If we stopped "headcanoning" and took the time to appreciate things as they were, without the need for an explanation when we were given an official one, then you would realize that it's much simpler than what we're trying to make out of it. Beerus killed Zamasu when Trunks arrived to warn them about Goku Black, but the latter would not have existed with Zamasu dead, so his plan was carried out as a possibility, from the perspective of the main line and Trunks' future, because Goku Black jumped sideways from another. It means that Trunks could only have warned the others without Zamasu being killed by Beerus. The anime adds Goku Black's challenge in the past as a bonus and it doesn't interfere. Desassina wrote: I read through all that and I still don't get the incessant need to find the origin of these time trips. If we stopped "headcanoning" and took the time to appreciate things as they were, without the need for an explanation when we were given an official one, then you would realize that it's much simpler than what we're trying to make out of it. The reason for the "incessant" need to explain things is the same reason to explain anything - to understand. What event causes the timelines to be created, why they are created, and when are all important. For me, I like to make sense of things. I guess it's the scientist in me, but I appreciate it a lot more when going deeper than just the simplified explanation. The main timeline is not the original timeline. The original timeline is the one in which Goku dies due to the heart virus and where Imperfect Cell kills Trunks. As you said, time flows from past to future. Therefore, it's best to explain things from the perspective of the original timeline because this is the starting point. Cell went back in time 1 year prior to Future Trunks first arrival. He did not have any knowledge of Future Trunks killing Cold and Freeza from the supercomputer because that never happened in his timeline. In his timeline, Cold and Freeza came, and were most likely killed by Goku who used Shunkan Ido to arrive at the scene in time. He further stated that he has the genes collected from Cold and Freeza, but not Future Trunks which makes sense since Future Trunks didn't kill Cold and Freea in his timeline. He used the default settings that were already configured in the time machine - Age 764, August and changed it back by 1 year, then pressed a button. He arrived in Age 763. Trunks was going to make two trips regardless of Cell. The first trip was to give Goku the heart medicine. The second trip was to find a weakness or strategy to beat Androids 17 and 18 - blueprints. Before Cell traveled to the past, it was Androids 17 and 18 that attacked South City, not 19 and 20. 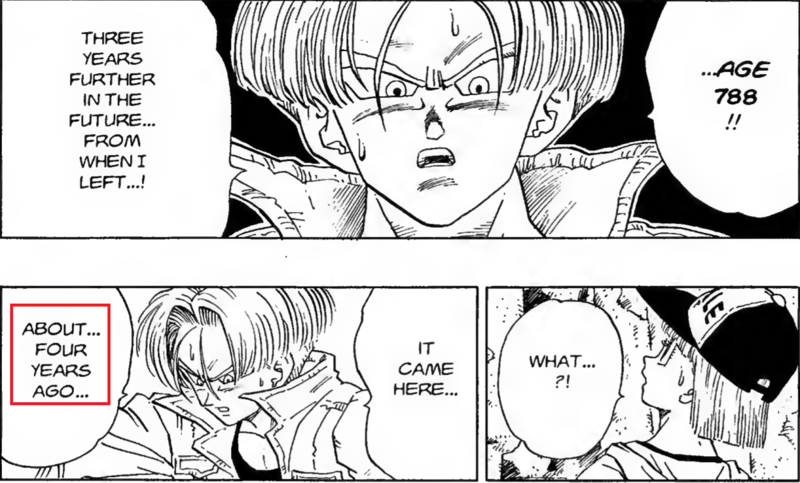 In Trunks' timeline, he had never seen 19 and 20. He wondered why history changed so much. The reason was that Cell's arrival to the past caused a ripple in time, which changed events slightly so that Androids 17 and 18 were stronger and Dr. Gero and Android 19 attacked South City instead. In the Unseen (Timeline 4), the Androids 17 and 18 were defeated and Trunks took 17's blueprints to the future because Cell did not exist in that timeline. The Trunks that took the blueprints did not stay and train with Vegeta, so was killed by Cell in the future. Cell took the time machine to the past which caused Trunks to stay and train. This created a "paradox". We need a Trunks that left without training to be killed by Cell as well as a Trunks that stayed and trained and killed Cell in the future. Therefore, you have a split of the main timeline and the future timeline. The future timeline got split from Timeline 3 (original) to Timeline 2 and 3. The main timeline got split from Timeline 4 into Timeline 1 and 4. All of this is already stated in the Daizenshuu 7 and Chouzenshuu 4, so there isn't any headcannon even needed. The chart you posted is for DBS. That has nothing to do with the timelines created in DBZ. For those timelines, you need to use the official databooks - Daizenshuu 7 and Chouzenshuu 4. The headcannon that's needed is to explain the timelines in DBZ and DBS such that they satisfy the number of time rings shown. 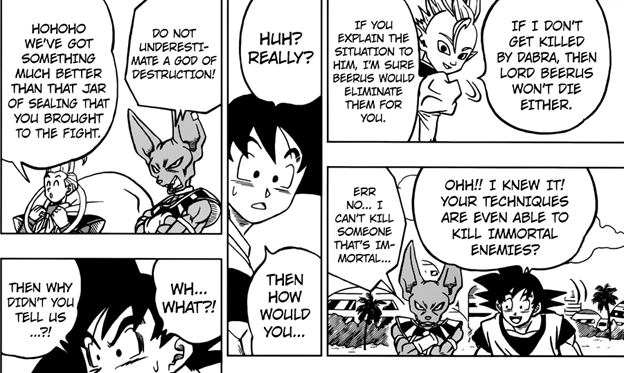 Desassina wrote: Beerus killed Zamasu when Trunks arrived to warn them about Goku Black, but the latter would not have existed with Zamasu dead, so his plan was carried out as a possibility, from the perspective of the main line and Trunks' future, because Goku Black jumped sideways from another. It means that Trunks could only have warned the others without Zamasu being killed by Beerus. The anime adds Goku Black's challenge in the past as a bonus and it doesn't interfere. 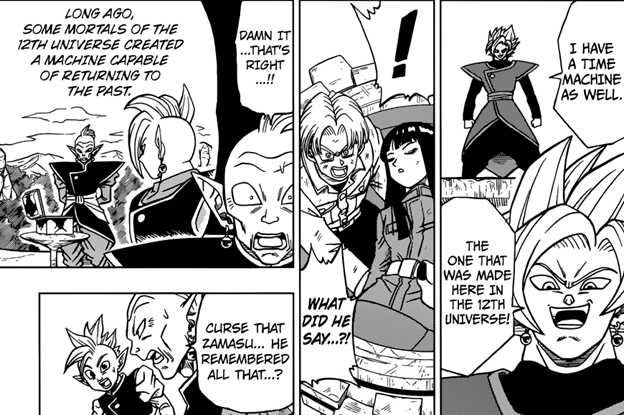 Yes, Trunks came from the future to warn them about Zamasu which led to Zamasu being hakai'd by Beerus. This created a paradox since Trunks wouldn't have arrived from the future if Zamasu didn't become Black. Therefore, Beerus killing present Zamasu split the main timeline. One main timeline is one in which Zamasu successfully lives and becomes Black. The new main timeline (the one we watch), is the one where Zamasu is hakai'd. Black's challenge to Goku is merely a result of his time ring following the distortion in time created by Trunks' time machine. Nothing I've told you contradicts with any of the official charts I've posted and sourced. The hard part was explaining DBZ, DBS, and then trying to fit in the expanded DB verse that included DBO and other seemingly non-canon stuff like Xenoverse, GT, DBH, and movies. Basically, I had to imagine that, for Trunks to not have departed to the past, so that Zamasu completed his plan, Cell killed him and went back to create a copy of the mainline. This copy would have developed into the Buu saga, BoG, RoF and the U6T before Zamasu saw everything on GodTube. Your first timeline should be the original timeline, Timeline 3. As you said, Goku kills Cold and Freeza. However, Trunks cannot sneak into Dr. Gero's lab as he is only a baby at the time the Androids attack South City. Gohan survives and trains Kid Trunks. Bulma makes the time machine and the Trunks from this timeline travels back in time. Future Trunks returns to this timeline with the blueprints. The Androids are destroyed with the remote controller that was designed from Future Bulma using the blueprints. Cell kills Trunks in this timeline, taking his time machine to the past. Your second timeline should be the Unseen Timeline, Timeline 4. Future Trunks has no idea where Dr. Gero's lab is until he chases him in his second trip. Future Trunks makes two trips regardless as I said before. He finds the blueprints from the basement lab later. There's a 3 year gap between Trunks arriving the first time and the androids being activated. For you to say that Trunks never left and stayed, means he stayed in the main timeline for 3 years! In this timeline, Trunks finds the blueprints and goes back to the future. The Androids are defeated by Goku, Vegeta, and Trunks. Three Super Saiyans were enough because these Androids were just as strong as the ones in the future. There is no Perfect Cell in this timeline, no Cell Games. Your third timeline is the current main timeline, Timeline 1. This is all correct. Your fourth timeline is Timeline 2, the future timeline in which Trunks has killed Cell and the Androids. The same timeline in which Black invades and is erased by Zeno. This is all correct. Your fifth timeline is Timeline 6, the former main timeline in which Zamasu is alive and succeeds in switching bodies with Goku to become Black. This is all correct. Your sixth timeline doesn't make any sense. There is only 1 timeline in which Cell kills Trunks and takes the time machine - the original timeline, Timeline 3. This timeline should really be the new future timeline in which there are two pairs of Trunks and Mai living. It's Timeline 7. Basically, your third to fifth timelines are correct since these are the timelines that occurred during DBS and you used Toyotaro's chart. So all you need to fix, is your first timeline (Timeline 3 - Original) and second timeline (Timeline 4 - Unseen). Your sixth timeline (Timeline 7) should be the new future timeline in which Trunks and Mai now live in where there are two pairs of Trunks and Mai. Lastly, you are missing the first alternate timeline (Timeline 5) created by the Universe 12 time traveler. After all that, then you will get the correct number of time rings and be consistent with the Daizenshuu 7 and Chouzenshuu 4. I've got a couple questions on your theory (particularly the rules by which it operates). If one hour passes in timeline X, does timeline Y also advance by one hour? I think so, and the DBS manga does state this (I don't expect you'd disagree). Here's a tougher one. There's two timelines, X and Y. If someone jumps from timeline X to, say, timeline X+10 years, timeline X is advanced 10 years (duh). But, does timeline Y also advance 10 years, or does it remain at its previous age? In other words: is timeline Y fast-forwarded or not? Hey, good questions. Yes, if time passes in one time, the same time is also passed in a parallel timeline. Though with a time machine, one can visit another timeline at any point in time. For example, Future Trunks went back to the future after giving Goku the heart medicine. He spent approximately 1 year in the future, to refill the Time Machine with the No. 15 Electro Blue fuel. Then he went back to the past but 3 years later from the last point in time. So it really doesn't matter since with a time machine, you can select when you you want to arrive. I think mainly you want to avoid visiting a point in time where there is already a version of yourself otherwise there are two copies. One should also note that in certain dimensions, time passes differently like the Room of Spirit and Time, World of Void, and the Time Nest. In RoSaT, time moves faster. In World of Void and Time Nest, they are outside of space, real world time, and the 12 universes so time moves considerably slower such that to an outside observer, no time is passed. Think of Flash moving so fast that it looks like time has stopped around him. That is, time is relative. For example, the 48 minutes that passed in the World of Void, would be like no time has passed at all to an outside observer like Bulma. Therefore, when the Z senshi return from the World of Void back to Earth, Bulma wouldn't have noticed any time passed. This is also why all the Time Patrol stuff can fit without changing anything. 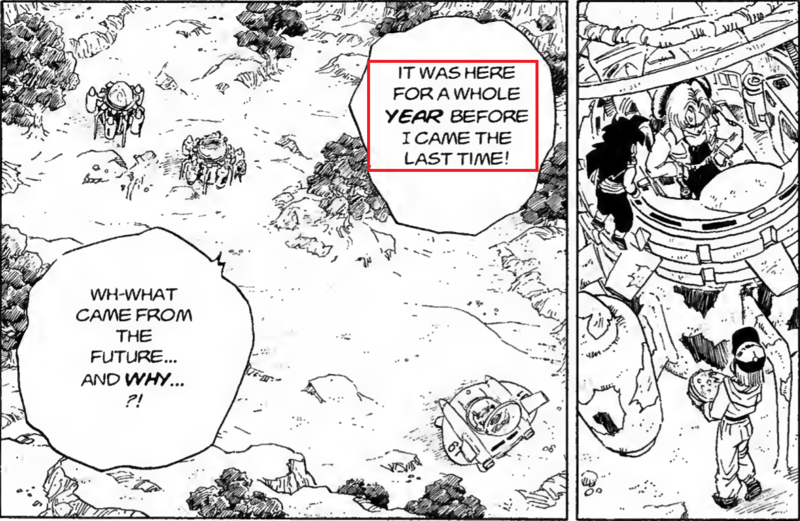 It's true that Trunks spent one year in the future and went back three years further than the last time. That means that right before his second trip, his timeline was at 785 and the past was at 765. Trunks aimed at 767, so he basically went two years into the future. The question is: after Trunks arrived in the past again (in 767), what year is it in his future? 785 or 787? Terra-jin wrote: It's true that Trunks spent one year in the future and went back three years further than the last time. That means that right before his second trip, his timeline was at 785 and the past was at 765. Trunks aimed at 767, so he basically went two years into the future. The question is: after Trunks arrived in the past again (in 767), what year is it in his future? 785 or 787? Trunks' time machine is programmed to go to the date in the future from when he left the last time. Trunks traveled the first time from Age 784 (future) to Age 764 (past). He gave Goku the heart medicine and then went back to the future, Age 784. He spent less than a day in the main timeline, so less than a day passed in the future timeline. Then he waited 1 year, and went back a second time from Age 785 to 3 years after - Age 767. This time, Trunks spends a few weeks with the Cell Games, so a few weeks also pass in the future. When he returns to the future, he's returning to the same time when he left - Age 785 not Age 787, but a few weeks later. Future Bulma uses the blueprints and makes the remote controller. Trunks defeats the Androids in Age 786 - one year after he arrived (Unseen Timeline), but in Timeline 2, he didn't need to wait 1 year. He had enough power to destroy the Androids himself in Age 785. Cell arrives 3 years later in Age 788. In DBS, they made multiple trips back and forth between the future and present. Time that elapsed in the present also elapsed in the future. This is why you are asking me this question. The story was told in a way to make it easier for the audience to understand. So while Goku and Vegeta were training and preparing to revisit the future, Trunks and Mai were holding off Black. In the DBS Manga, Chapter 21, Goku and Vegeta just escaped back to the present after being defeated by Black. Goku and Vegeta take their own sweet time talking and recovering. Goku trains to learn the Mafuba and Vegeta spends an entire day in the RoSaT. So basically at least 1 day has passed in the main timeline. In this case, 1 day also passes in the future. Trunks and Mai are saved by Gowasu and rest on Kaishin planet for 1 day. When Goku and Vegeta went back to the future a second time, Bulma used the default settings on the time machine to go back to the future, not to the exact point in time from when they left, but 1 day after. The Time Machine most likely has its own internal clock to know how much time has elapsed. Therefore, when Bulma keeps the default settings to return to the future, the Time Machine goes to the same point in the future plus the time that has elapsed based on its own internal clock. 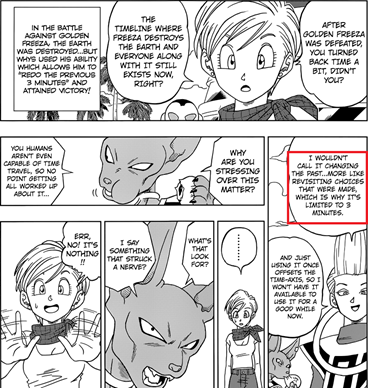 If Bulma changed the settings to an earlier date in the future - let's say she went to the future just before Black arrived, then that would create a new parallel timeline. That's why they had to go back to the future, to the same time without changing the settings. This part is just theory though. But what year is it in Trunks' timeline at the moment he has arrived in the past? This is crucial to my next point. Terra-jin wrote: But what year is it in Trunks' timeline at the moment he has arrived in the past? This is crucial to my next point. The same year from when he left. To put it simply, if Trunks from the future leaves from year X to another timeline to year X - y, it is still year X in his future timeline. It doesn't matter what timeline he goes to and how far back he goes to, the year is still X in his own timeline. Additionally, if he returns to the future at a point in time before year X, then a new parallel timeline will be created. Alright, so when the main timeline is at 767, Trunks' future is still at 785. This means that from the perspective of the main timeline, time in Trunks' future stood still for two years. In other words: if we would formulate a time travel rule, it would be that when you travel to the future, you fast-forward the destination timeline, while other timelines are frozen in time. Let's suppose that someone from the main timeline also makes a trip - from 765 in the main timeline to 787 in Trunks' future. In 765 in the main timeline, Trunks' timeline was at 785. This means that this trip would go two years into the future of Trunks' timeline. If we're following the above-mentioned rule, the main timeline would stand still while Trunks' future is fast-forwarded two years. As you can see, this leads to a logical contradiction: both timelines would stand still from each other's perspectives for two years. For this reason, it must be the case that trips to the future fast-forward all timelines equally. This also fits nicely with the idea that timelines are separate worlds. Just as all universes (1 thru 12) are affected equally by time travel, so should all timelines. Terra-jin wrote: Alright, so when the main timeline is at 767, Trunks' future is still at 785. This means that from the perspective of the main timeline, time in Trunks' future stood still for two years. In other words: if we would formulate a time travel rule, it would be that when you travel to the future, you fast-forward the destination timeline, while other timelines are frozen in time. Timelines aren't frozen or fast-forwarded. Each timeline is still moving in the same exact pace. Time doesn't slow down or get faster in either timeline. Trunks leaves from the future at year X to go back in time to a alternate timeline in year X - y. It doesn't matter what the value of 'y' is, his own future will always be the same time he left, year X. He spends "b" years in the alternate timeline, then "b" years will also pass in the future timeline from where he was from. If he goes back to the future, he would go to year X+b. If he goes to the future before X+b, then he would have created another timeline. He spends "b" years in the alternate timeline, then "b" years will also pass in the future timeline from where he was from. I agree with this. Time spent in one timeline also passes in the other(s). his own future will always be the same time he left, year X. If that's true, then you cannot deny that time stands still in his future. In 765 in the main timeline, Trunks' future is at 785. In 767, Trunks' future is still at 785. Hence, time stood still in Trunks' future while the main timeline ran two years from 765 to 767. Terra-jin wrote: If that's true, then you cannot deny that time stands still in his future. In 765 in the main timeline, Trunks' future is at 785. In 767, Trunks' future is still at 785. Hence, time stood still in Trunks' future while the main timeline ran two years from 765 to 767. Time didn't freeze or stood still. An Age in one timeline is not equal to an Age in another timeline. The timelines are both flowing parallel but one time point does not equal another time point in another timeline. If Trunks comes from the future timeline (Age 785) to main timeline (Age 765), the year is still Age 785 in the future timeline. Now if he spent 2 years in the main timeline (Age 765+2=767), then 2 years have also passed in the future, (Age 785+2=787). This is different however, if Trunks makes a first trip from Age 785 to Age 765, spends a day. Then goes back to the future to Age 785+1 day. Then makes a second trip to Age 767 of the main timeline. Here, the Age in the future is the same from when he left - Age 785+1 day. Time didn't freeze or stay still. It's just relative. 1. Right before Trunks' second trip, it's 785 in his timeline. 2. Meanwhile, it's 765 in the main timeline. 3. After his second trip, it's 767 in the main timeline. 4. Meanwhile, (according to you) it's still 785 in Trunks' future. Agreed on the above points? You're correct that an age in one timeline is not equal to the age in the other timeline(s). After all, it's not 785 in both timelines. You're also correct that when Trunks leaves 785 in order to travel to 767 , his timeline's current age does not rewind to 767 . Accepting all these premises, it still results in the conclusion that from 765 to 767 in the main timeline, Trunks' future remained at 785. I think we agree on what happens when one travels to the past, but disagree on what happens when one travels to the future. When you travel y years to the past from year X, it's still year X in your home timeline, just as you said. When you travel y years into the future from year X, I say all timelines are at year X + y, because I can demonstrate that the alternative leads to logical contradictions (see the example in my earlier post). It may also help to point out that when Trunks traveled from 785 to 767, he actually traveled to the future - the future of the main timeline. I agree with all these points. I'm just saying that time doesn't freeze or stand still, but that it is always flowing. We agree on the same points, but perhaps the wording or explanation of it is different. If someone travels 'y' years into the future (of any timeline), all timelines are advanced 'y' years. 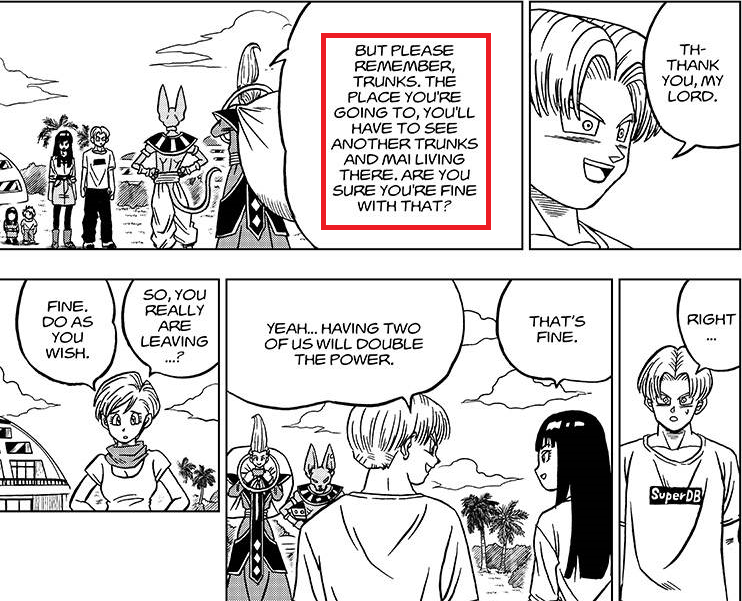 The implication of this rule is that Trunks' future is at 787 after he arrives in 767, not 785. Oh ok, well this is where we disagree. I'm saying it is still Age 785 not 787 in the future even when he travels from Age 767. We already know what year it was when Trunks returned to the future from the past. His first trip was from Age 784 to Age 764. He returned to Age 784 in the future and spent 1 year. Then he returned to the past, but 3 years later from Age 785 to Age 767. Then, when he returned back to the future, it is still Age 785. He killed the Androids in Age 785 and then killed Cell in Age 788. Hence, if your theory that the future timeline is fast forwarded were true, then the year in the future after he returned after the Cell Saga should have been Age 787, but it was not. It's all correct! Paradoxes are identified correctly, as are the origins for each timeline split. I can sign off on this breakdown. And yes, we end up with seven timelines total: six related to the events of the series, one identified by the manga's dialogue about the Universe 12 time-traveler, should you choose to include that. Last edited by Cipher on Sun Jun 03, 2018 12:40 pm, edited 1 time in total.